The Herbaceous Peony has long been a stand-by of American gardeners, and rightly so since it, in its many different hybrids and cultivars, is one of the most spectacular, reliably perennial flowers of late spring. But why then, does one so rarely see its relative the Tree Peony in our beds and borders? 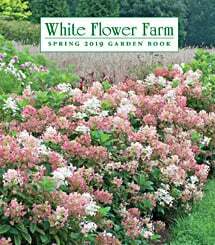 This hardy, deer-resistant shrub, the national favorite in its native China, flaunts exquisite blossoms measuring as much as 10 inches across in May or June, and a mature specimen may bear 50 of these silken-petaled show-stoppers all at once. It's our goal to see both types of Peonies receive the garden space they deserve. Certainly, few plants offer such long-lasting return on your investment. Herbaceous Peonies, given minimal care, can continue to bloom, spring after spring, for fifty years or more; there are reliable accounts of Tree Peonies in Chinese temple gardens that have bloomed for centuries. Our selection of Peonies -- Herbaceous and Tree -- hits the high notes in the full range of floral types, from elegant singles to ruffled doubles as luxuriant as crinoline petticoats. In our online and print catalogues you'll find a range of old-time stalwarts such as the Herbaceous Peony 'Festiva Maxima', a favorite since 1851, together with contemporary prizewinners such as 'Coral Charm', and exotic imports such as the cherry-blossom-pink Japanese Tree Peony 'Hana Kisoi'. We ship Herbaceous Peonies as large roots with 3-5 eyes, fresh from the growing fields, at the proper time for fall planting in your region. Our Tree Peonies are shipped as 3-year-old, grafted, 12-18 inch bareroot plants in both fall and spring. Well-drained soil rich in organic matter is desirable. If your soil is extremely acid, add a few handfuls of lime at planting time. Plant the roots of Herbaceous Peonies with the eyes (the pink or white buds at the top of the roots) pointing up and cover with one to two inches of soil in the North and no more than one inch in the South. (Please note: If the eyes are set deeper than recommended, plants may not bloom. For this reason, do not mulch over the crowns.) Don't be surprised if there are few or no flowers the first spring after planting; plants generally take a few years to settle in and bloom heavily. Peonies respond well to an annual sidedressing of one inch of compost or aged manure; no other fertilization is necessary. Many Peonies, certainly the double-flowered varieties, must be staked to prevent a thunderstorm from pushing their blooms into the mud. Set the supports in place as new growth begins to emerge in early spring. Few insect pests bother Herbaceous Peonies, but a fungal disease called botrytis may be a problem, especially in very wet seasons. The stems of Peonies develop cankers or blacken at the base and fall over or simply wilt. Leaves may show black or brown patches and buds may turn brown and fail to open. Good culture and sanitation in the garden can help prevent or correct these problems. Plants need good drainage and air circulation, so do not crowd. Remove any affected foliage at the first sign of disease and deadhead religiously, removing all flower parts and petals from the garden. Cut off all foliage just below soil level after a killing frost in the fall and remove it and any debris from the area -- do not compost. If botrytis was present the previous spring, add a shallow layer of sand around the plants and crowns and spray newly emerging shoots with Bordeaux mix or lime sulfur following label directions. Fungal spores overwinter at the base of the plants, and spring rains then splash the spores up onto the new shoots. Removing any debris and old foliage and covering the soil with sand helps prevent reinfection. Another blight known as phytophthora may also appear, but the two diseases are hard to tell apart. Take a sample to your USDA Cooperative Extension Service agent or a specialist if you suspect phytophthora, as this disease is usually fatal to the plant and infected plants should be dug up and destroyed, and the soil replaced before replanting. Ants are often seen moving around on the buds of Herbaceous Peonies. They are attracted to substances on the petals and do no harm. Contrary to popular belief, they are not necessary for the buds to open. To enjoy the blooms of Herbaceous Peonies later in the summer, cut the buds just before they open on stems about 6 inches long. Lightly wet the inside of a large, resealable plastic bag, and place the buds inside. Close the bag and place it in your refrigerator (not the freezer). Later take out the buds you need and float them in a shallow bowl of water. When bud is about 1/3 open, lift it, then cut the stem to 1 1/2 inches long and refloat the bud. Peonies flower with Roses and Clematis and are lovely with many other perennials; be sure to leave room around the plants for air circulation. White-flowered Peonies are entrancing against a background of evergreens. Spring-flowering bulbs such as Crocus vernus or Scilla siberica create a pleasing color contrast at the feet of emerging Herbaceous Peonies stems, which are often reddish. Many varieties make several side buds that will open after the terminal bloom flowers, so deadheading is beneficial. After each flower is finished, cut the stem underneath the old bloom, leaving the foliage alone. If exhibition-sized flowers are desired, remove the side buds as they form and leave only the terminal bud. Generally Herbaceous Peonies do not need dividing and some resent it. However, if you must move an established plant you need to divide it before replanting. Do this in the fall, after all foliage has died back completely. Each division should have three to five eyes, and it will usually take a couple of years for the new plants to flower. Foliage of Herbaceous Peonies should be cut back in the fall and removed from the premises to discourage overwintering of pests. Mulch new plants with evergreen boughs or salt marsh hay after the ground freezes. Early Spring: Water plantings well if spring rains don’t do it for you. Side dress Herbaceous Peonies with compost or aged manure. If botrytis blight was present the previous season, cover ground around plant with a thin (one-quarter inch) layer of sand and spray new shoots with Bordeaux mix or lime sulphur. Set stakes or other supports in place now. Light shade from hot afternoon sun is necessary to protect the flowers, and in China and Japan small parasols are set over the plants to block the sun. Plant Tree Peonies where they will be protected against drying winds in summer and winter. Tree Peonies are very drought tolerant once established. Do not overwater and do not plant near an automatic irrigation system. Wait until the soil has dried down to four inches before watering deeply. Watering too much will kill the roots and is a common reason for failure. Tree Peonies need a well-drained soil with a pH close to neutral or a bit above. If your soil is acid, add a few handfuls of lime at planting time. Plant at the depth indicated by the green plastic ribbon wrapped around the main stem, and remove the ribbon after setting the plant at the right depth. If the ribbon has gone astray, plant the top of the graft union (which appears as a bulge on the main stem) about four to six inches below the surface of the soil to encourage the scion to form its own roots. Topdress plants in spring with an inch of compost or aged manure. A foliar feeding with fish emulsion is appreciated during the growing season. On rare occasions, a boring insect may make a hole in the woody stem of a Tree Peony. You may be able to kill the larva in the tunnel using a thin wire, or simply cut out the affected area. Like Herbaceous Peonies, Tree Peonies are occasionally afflicted with fungal diseases that cause black spots on leaves and wilting of shoots. Remove any diseased foliage as soon as noticed and be sure to clean up all fallen plant parts in the autumn. If fungal diseases become a problem, spray with a fungicide early in spring, repeating the treatments for several weeks. Be diligent with deadheading and do not allow fallen petals to remain caught in the plant or on the ground. Hellebores, Alchemilla, Leucojum, Epimedium and Siberian Irises are all lovely in combination with Tree Peonies. If your plants tend toward legginess, underplant with spring-flowering bulbs. Never prune Tree Peonies back to the ground as is done with their herbaceous relatives. Prune out any damaged or broken stems after plants leaf out. Once your plant has some age and is growing vigorously, you may want to open up the center a bit to encourage flowering on the taller stems and increase air circulation. Tree Peonies are grafted onto Herbaceous Peony roots and occasionally a shoot from the rootstock will arise from the base of the plant. These should be removed immediately. Tree Peonies do not need to be divided, and with many plants this is impossible. Young plants may be moved when dormant; dig the plant keeping as much soil around the roots as possible. Remove all foliage from Tree Peonies after a killing frost, including leaf petioles; discard away from your garden area, not in the compost pile. New plants should be mulched, and in the coldest areas should be wrapped with burlap or another material to protect from winter winds. Mid-Spring: Some Tree Peony varieties may need support for the heavy flowers. If the interior of the plant is crowded with foliage, thin it out to improve air circulation.